Following the highly successful launch of the “Discover Dunmanway” brochure, website and VIP (Visitor Information Point) earlier this summer (reported here) Dunmanway Tourism Initiative teamed up with local film maker Brendan Hayes to create a promotional video featuring the many tourism attractions available to visitors to the town. 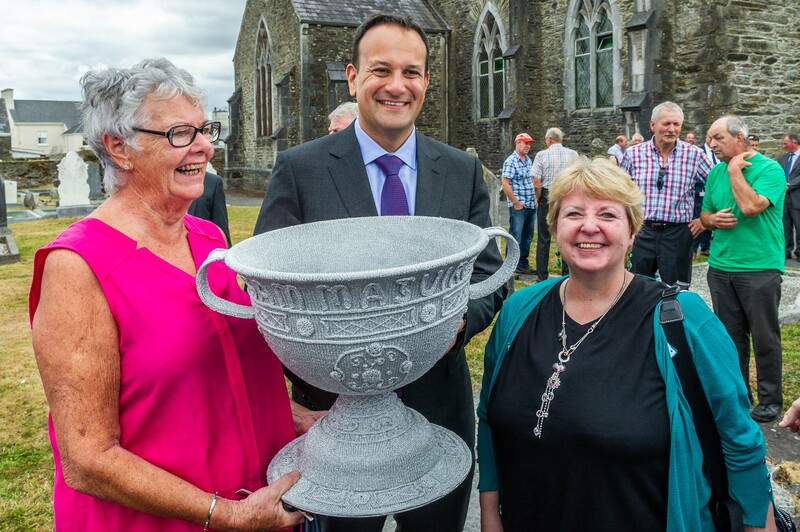 An Taoiseach was shown a knitted version of the Sam Maguire Cup, made by local ladies. Photo: Andy Gibson. I was genuinely blown away by this video promoting my home town. It showcases Dunmanway’s many treasures and puts Dunmanway well and truly on the map for tourism in West Cork. Darren also commended the Rev. 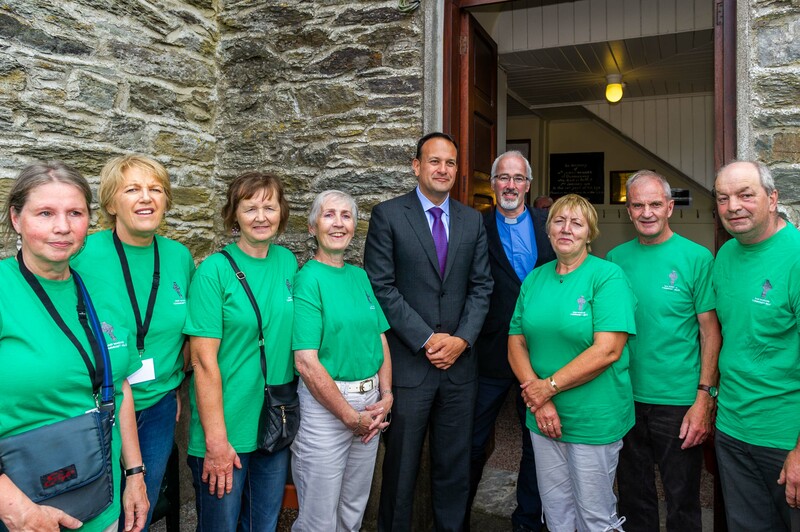 Cliff Jeffers, Brendan Hayes and the organisations involved in Dunmanway Tourism Initiative for all their hard work in bringing this project to completion. Dunmanway offers several visitor attractions, many of which are free, including the Sam Maguire Visitor Experience at St. Mary’s Church, the burial place of Sam Maguire, the Sam Maguire Community bells, guided and self-guided historic walking tours, Sam Maguire’s Homestead, and Dunmanway’s own state of the art Swimming Pool. Details of all attractions can be seen on www.visitdunmanway.ie as well as in the Free ‘Discover Dunmanway’ Tourism Brochure, which is available in outlets throughout West Cork. 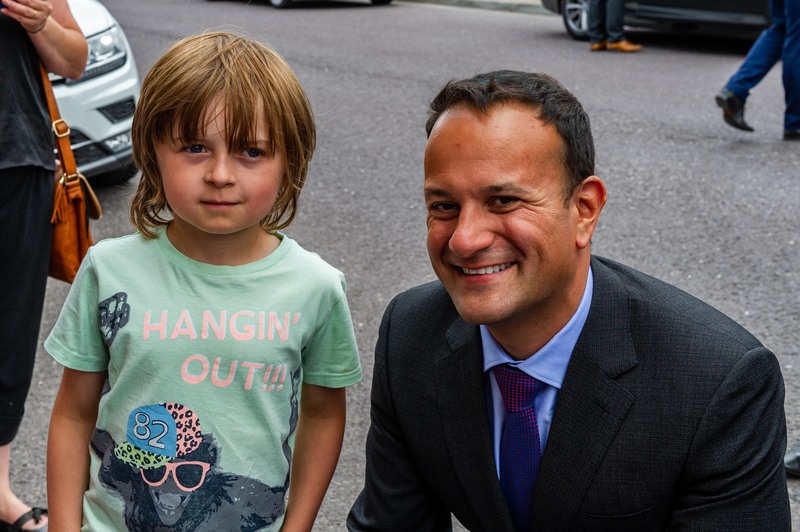 An Taoiseach met young Ryan from Dunmanway. Photo: Andy Gibson. The Sam Maguire Visitor Experience at St. Mary’s Church in Dunmanway is open every day during the Summer from 12 noon to 4pm. Visitors are welcome to find out more about the man behind the famous trophy through visiting his grave, church, watching short information videos and ringing the Sam Maguire Community Bells. 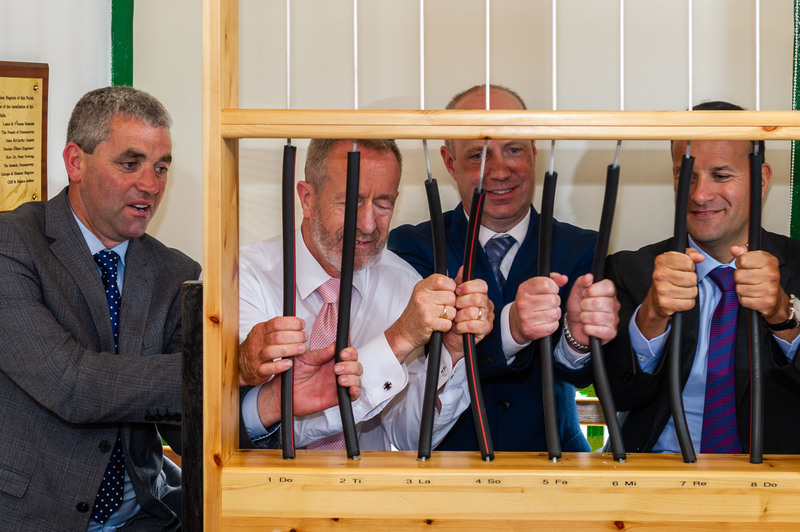 An Taoiseach rang the chimes in the Church bell tower along with Senator Tim Lombard, Sean Kelly, MEP and Jim Daly, TD. Photo: Andy Gibson. So many people know the name Sam Maguire, but we want people to experience the fascinating story of the man behind the cup by visiting the many attractions in his hometown of Dunmanway. This entry was posted in Centenaries in Ireland, Church in Society, Community Involvement, Contemporary Issues, Decade of Centenaries, GAA, Official Opening, Parish News, People from Cork, People from the Diocese, Taoiseach. Bookmark the permalink.